I am not 100% positive this works 100% of the time for Title 32 or Title 10 National Guard. I know it works 100% of the time for active duty US military, as it has since at least 2012. I am putting it out there because I think many National Guard/Reservists members are eligible for this program. So far I just have a few data points to support this assumption. I need more data. Every Guard/Reservists who has contacted me and applied for SCRA with Title 10 or Title 32 orders has had the fees waived thus far. SCRA benefits were applied, no problems. Until I remove this bold top section, proceed at your own risk! Note that it's a pretty low risk, since worst case scenario you pay the $550 annual fee for one year and you get all the amazing benefits of the AMEX Platinum card. I will update this post as more data streams in. If you are in the Guard or Reserve and have successfully received SCRA annual fee waivers from AMEX, please let me know either by email or in the comments below. Thank you for helping your brothers and sisters in arms! US National Guard and Air Guard servicemembers serving their countries under Title 10 and Title 32 orders greater than 30 days are eligible for American Express SCRA credit card annual fee waivers. Got a notice back today that AMEX has put my account under SCRA protections…Title 32 didn’t seem to be a problem. I am on a finite set of orders, ending 30 Sep in my case, my notice said I would be protected until the end of my orders. I’ll just have to send in a new set of orders, if I get carried on AD after 30 Sep. Anyway, there you have it. And thanks to you for all your info! I only wish I had known all this 15 years ago! Click here for more information on the American Express SCRA program. You can read about how I originally discovered this benefit while on active duty and got the word out to my email subscribers way back in 2013. 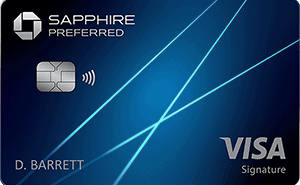 American Express and Chase both waive the annual fees on all of their personal credit cards. AMEX goes beyond and waives the annual fees on all of their business cards as well. If you are National Guard on Title 10 orders, you can check your SCRA status at this site and your MLA status at this site. If the end date is in the future and your status is “Yes,” then you are eligible for Title 10 SCRA coverage until your end date. If the SCRA check comes up with N/A, then you can still apply for SCRA benefits from AMEX, you may just need to provide a copy of your Title 32 orders. Step 1 – Open an American Express Platinum card (more information on the card here) or any of the other excellent American Express cards with no annual fees for military. Step 2 – As you are spending to meet the minimum spending for the huge welcome bonus (learn more about maximizing your military credit card benefits in my course, apply for SCRA benefits through this link or on your AMEX account services page. Thank you for your recent request for benefits under the Servicemembers Civil Relief Act. We will make every effort to complete the review within 60 days of receipt of your request. You will be notified in writing of the actions we have taken. You may check the status of your request at any time by visiting americanexpress.com/inquirycenter. We are grateful for the service and devotion you have shown to our country. You may be asked to provide a copy of your orders. If you are asked, just upload the orders to the secure AMEX site as requested. Redact any information you don't feel comfortable sharing with them, but remember they already have your Social Security number! 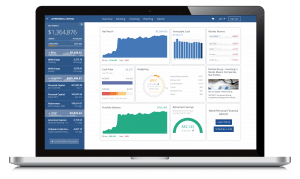 The AMEX SCRA review process usually takes 2-3 weeks to complete. If you are charged an annual fee in that time, AMEX will refund it. 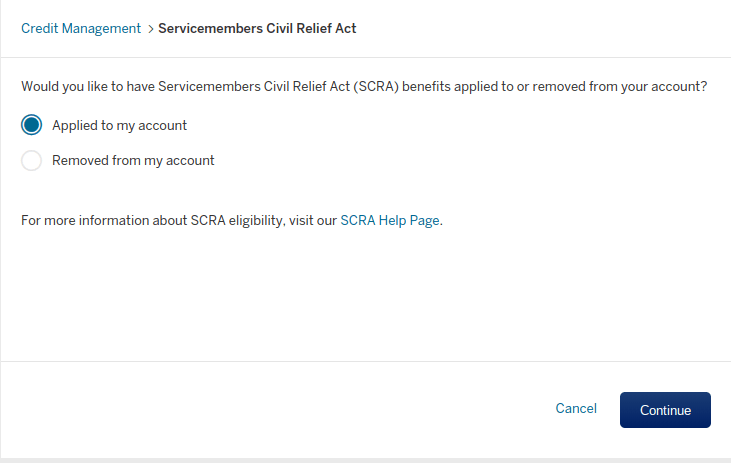 Recently my wife applied for the SCRA benefits as a military spouse. She applied on Feb 27 and the case was closed 4 March, so only 5 days with a weekend in the middle. What are the AMEX SCRA Benefits for Title 32 National Guard? This is NOT due to the SCRA law. 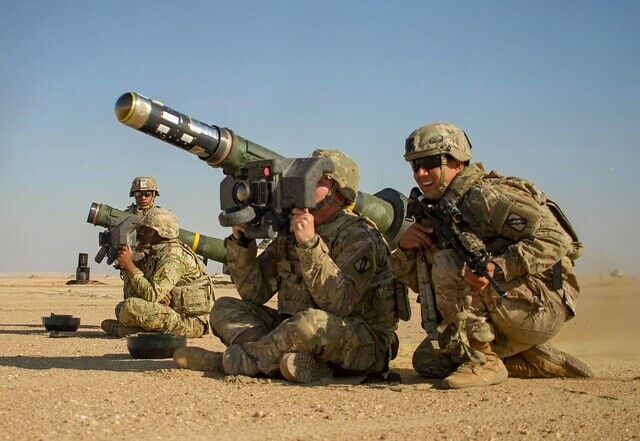 The way the SCRA law is written, only Title 10 National Guard members are eligible for SCRA benefits. However, American Express goes above and beyond what is required by the law to support the men and women of the National Guard. Why do they do this? I don't think it's out of the goodness of their heart. I think it's due to AMEX's lawyer's interpretation of the SCRA and Military Lending Act (MLA) laws. 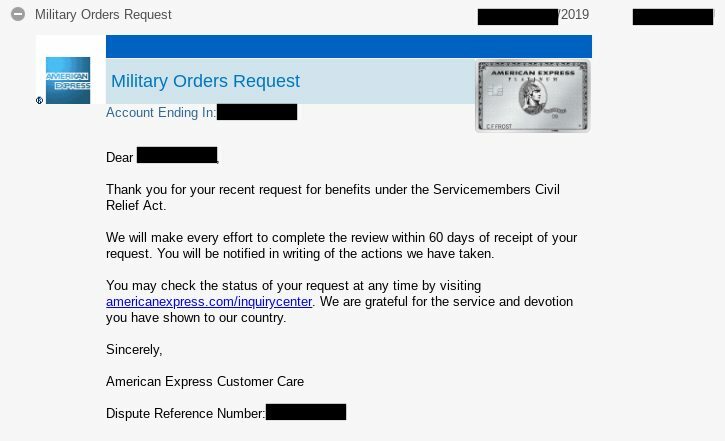 AMEX proceeds with an abundance of caution with how they treat military servicemembers, no matter what their activation status. AMEX has probably calculated that rather than risk lawsuits, federal legal action, and bad press from negative treatment of servicemembers, they would rather just not charge fees to US military and be done with it. What Happens When My Title 10/32 Orders End? Ok now this is a tricky one. I will be honest, I'm not sure. If anyone does know, please sound off in the comments. My best guess is AMEX will get in touch with you to confirm your status and ask you to provide documentation you have been extended beyond your original orders end date. If you cannot produce new orders, I suspect they will remove you from SCRA protection and you will be eligible for annual fees at that point. I suspect they will not charge the annual fee until your card anniversary, or the day you opened the account. Please note that AMEX will refund the annual fee completely if you cancel the card within 30 days after the statement in which the annual fee hits. So if the annual fee is charged April 2, the statement closes April 30, you have until May 30 to close the account and get a full refund. If you product change the card, so for instance downgrade your AMEX Platinum to a no annual fee AMEX Everyday card, you can keep your Membership Reward points and the annual fee will be prorated. For example, if you wait 6 months after the annual fee is charged on the AMEX Platinum, you will receive $225 back after the product change. Why Should I Get the AMEX Platinum? See why this is my top recommended card here. Do you ever travel? Hate airports? Let me tell you about airport lounges: free food, free drinks (usually beer, wine, and mixed), quiet, and separated from the loud and obnoxious crowds. It will change the way you travel and make travelling so much less of a painful experience. You can access over 1200 Priority Pass Lounges and the famous AMEX Centurion Lounges for free with the AMEX Platinum. You can even get a guest in free. I used the 60,000 point welcome bonus to upgrade my wife and me to business class. A 14 hour flight is much more manageable when you spend half the time sleeping. I can show you how to do this in my 5 day, free, military credit cards course. The Platinum Card from American Express has a $15/month ($35 in December) Uber credit, good for rides or ordering food on Uber Eats. You can also get $200 in airline fees reimbursed. You can read much more detail on the AMEX Platinum benefits in my post. 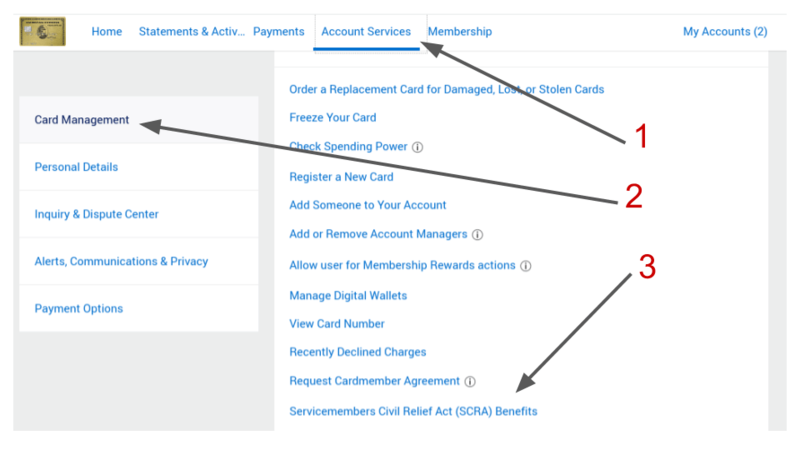 How Many AMEX SCRA Cards Can You Get With No Annual Fee? And those annual benefits are on top of the 250,000+ Hilton points, 260,000+ AMEX Membership Reward Points, 400,000+ Marriott Bonvoy points, and 75,000 Delta Skymiles I earned by meeting the welcome bonuses on these cards. 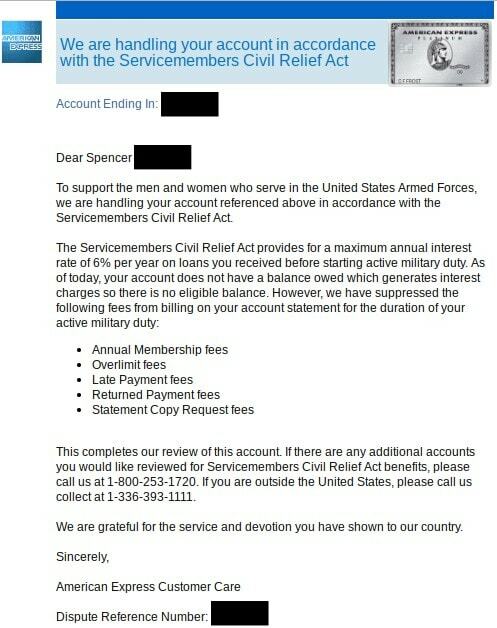 As you can see, the AMEX SCRA benefits are extremely lucrative for US military servicemembers. Lounge access, free hotel nights, free credit at the hotels, upgraded status, airline fees reimbursed, and free food make this a very lucrative hobby. Start travelling easier by taking my 5 day, 100% free, email based Ultimate Military Credit Cards Course and sign up for The American Express Platinum, my top recommended card, here.